In 1927, Henry Ford, the richest man in the world, bought a tract of land twice the size of Delaware in the Brazilian Amazon. His intention was to grow rubber, but the project rapidly evolved into a more ambitious bid to export America itself, along with its golf courses, ice-cream shops, bandstands, indoor plumbing, and Model Ts rolling down broad streets. Fordlandia, as the settlement was called, quickly became the site of an epic clash. On one side was the car magnate, lean, austere, the man who reduced industrial production to its simplest motions; on the other, the Amazon, lush, extravagant, the most complex ecological system on the planet. Ford's early success in imposing time clocks and square dances on the jungle soon collapsed, as indigenous workers, rejecting his midwestern Puritanism, turned the place into a ribald tropical boomtown. Fordlandia's eventual demise as a rubber plantation foreshadowed the practices that today are laying waste to the rain forest. More than a parable of one man's arrogant attempt to force his will on the natural world, Fordlandia depicts a desperate quest to salvage the bygone America that the Ford factory system did much to dispatch. As Greg Grandin shows in this gripping and mordantly observed history, Ford's great delusion was not that the Amazon could be tamed but that the forces of capitalism, once released, might yet be contained. 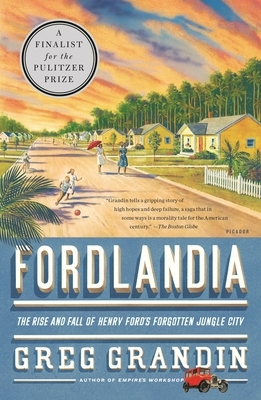 Fordlandia is a 2009 National Book Award Finalist for Nonfiction. Greg Grandin is the author of Fordlandia, a finalist for the Pulitzer Prize, the National Book Award, and the National Book Critics Circle Award. A professor of history at New York University, Grandin has published a number of other widely acclaimed books, including Empire's Workshop, Kissinger's Shadow, and The Empire of Necessity, which won the Bancroft Prize.